The Mossfields came around the bend and he could not see the end of their line. Twice my number, easily. Jack looked at him, but Paul did not see any hint of fear on the boy. Perhaps my father should have given him the ring. “You’ll want to speak to Lord Mossfield himself if he’s here. Do not treat with anyone lower than your station,” Loukas said as their group moved to meet them. Lord Mossfield was easy to spot. Enormously fat, he wore a green enameled breastplate large enough to fit Rock. Where his head met his shoulders there was only rolls of flesh beneath a small chin and a wide mouth with thick, purple lips. The top of his head was bald where the crown of Mossfield sat. Most Lords wore a chain and cloak but the frog lord chose a crown. Even in the cool wind the lord was sweating and smelled of the bogs. Jack coughed and Paul nearly gagged. He kept his composure as best he could and advanced Rock up to meet him. Jack and Loukas came as well. “That’s Sir Paulin to you, my Lord.” Each word was bit through clenched teeth. The frog lord shrugged massive shoulders and coughed, causing spittle to spray over Rock’s raven-shaped mantle. The destrier didn’t even flinch as it slid down the molded beak near his nose. “As you say, child.” Mossfield’s grin split his fat face, showing rotting teeth. His foul breath wafted toward him and Paul fought the urge to vomit. The irritation and anger that boiled inside of him was surprisingly strong and his left hand flexed, wanting his sword. “This man is Lord Halloway’s own son, Heir to Hallow Hill.” Loukas’s voice was strong and even, commanding the fat lord to listen. Mossfield took another frog leg from his retainer and chewed it, his fat lips smacking noisily. In the meanwhile, he noticed that the lord’s horse was having trouble supporting the weight. He must change them out every few hours so as not to kill them. Lord Mossfield giggled, his enormous bulk jiggling. “An untested boy and an old man came to tell me who should or should not pay tithe to me? I have a very good reason why they should, raven child.” He held up a thick hand and waved someone forward. The crowd quickly parted to reveal the largest man Paul had ever seen. He was easily seven feet tall and unlike Lord Mossfield, it was not fat that caused his girth but hulking muscle. The brute wore plate and chain with spikes at the shoulders and tips of his boots. In his hands he held a thick hammer with a head as thick as Paul’s thigh. His shield bore no House markings but the green enamel about its edge claimed him as one of Mossfield’s knights. He rode no horse. No horse would sit beneath him, except perhaps Rock. 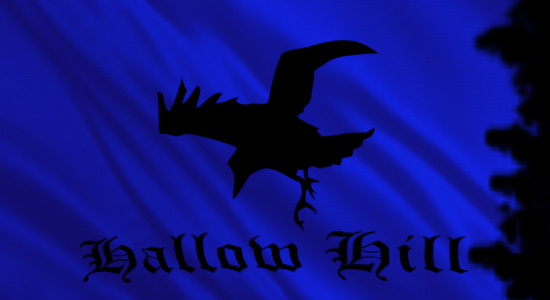 This entry was posted in Fantasy, Original Fiction and tagged Fantasy, Hallow Hill, knights, lords, medieval. Bookmark the permalink.